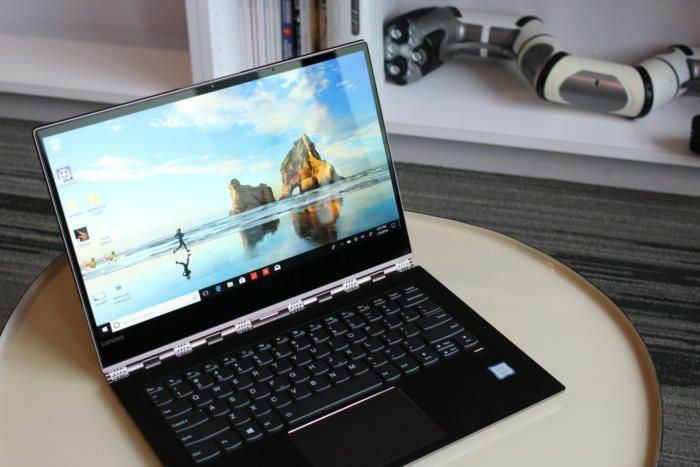 Lenovo Yoga 920 Review – 2017 was the year the ‘two-in-one’ PC – a laptop that folds into a tablet – began to look less like an unwanted novelty and more like something we’d genuinely want. That’s partly because a laptop can now be made slim and light enough not to feel ridiculous when wielded as a tablet with the keyboard still attached. Windows 10 must share the credit, too, for offering a Tablet mode and Windows Ink features that make switching from keyboard to touchscreen feel natural. The Yoga 920 embodies these virtues. Starting at a penny under twelve hundred quid, it’s not cheap, but you can see where all of those other pennies have gone. Lenovo’s all-metal case – available in copper, bronze or platinum-colored finishes – combines matt and polished surfaces for a strikingly upmarket feel. With its ‘watchband’ hinge, an intricate yet sturdy construction that holds the screen at whatever angle you choose, the whole machine feels like it would be more at home in the window of Tiffany’s than Currys. A nearly-14in screen is squeezed into less volume than many 13in laptops, and the designers have still found room for two Thunderbolt- compatible USB Type-C ports to connect accessories, drives or a monitor, and one full-size USB 3.0. Inside the model is an i5-8250U processor from Intel’s new eighth generation, with four cores and built-in UHD Graphics 620, enough to run many 3D games and keep creative software ticking over. Our pricier test laptop went one better with an i7-8550U and twice the SSD storage, at 512GB. We’ve noted before that this chip is a big step up in performance, and in our tests the Yoga 920 scored as well as many seventh- generation i5 desktop PCs in demanding tasks. Just as importantly, it eked almost 12-and-a-half hours of video playback out of its slim battery, making this a practical all-day travelling companion. That’s two hours more than Microsoft’s new Surface Pro, and four hours more than Dell’s bulkier XPS 13 2-in-1.